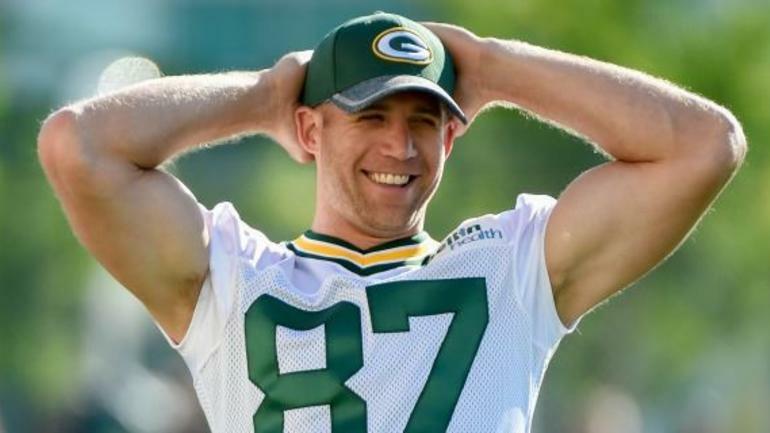 Jordy Nelson, who is popularly known as White Lightning is an American football wide receiver who was drafted in 2008 NFL Draft for the Green Bay Packers. He is best described by sports analysts and commentators as one of the best elite and he has won the Super Bowl and other notable awards in NFL as a footballer. He has bagged many awards and accolades for his versatility in the game of sports right from his college days; some of the awards are; The First Team All-Big 12 in 2007, The NFL Receiving Touchdown Leaders in 2016, Pro Bowl Mention in 2014, Best Comeback Athlete ESPY in 2017, to mention a few. He is happily married to Emily Nelson whom he was friends with from a very tender age in a kindergarten school. Jordy Ray Nelson was born to Alan and Kim Nelson on the 31st of May 1985 in Manhattan, Kansas. He grew up in Riley, a farmland acquired by his great-grandfather and which has served his family for about 4 generations. His parents, Alan and Kim are farmers. He has Swedish ancestry even though he was born as an American. The football star also has 2 siblings – Kelsey and Mike Nelson. He schooled in the Riley County High School where he participated in the high school’s football team dubbed the Falcons. There, he had 62% pass completion for 1029 yards and 8 touchdowns in his senior year. His outstanding efforts made the Manhattan Mercury name him a Flint Hill Player of the Year. Adding to his exceptional performance in football, he also played basketball and his average points per game was 17.2 points as an all-state basketballer he was part of the team that triumphed in an AAU Championship. Jordy Nelson’s performance in the tracks was also notable. He ran in 400m race with a time of 48mins 79sec, and 100m race clocking 21mins 64sec; he went on to record a long jump stat of a 7m stretch. After an active outing in the high school, he graduated and proceeded to Kansas State University where he continued with his studies and also played football. Jordy Nelson’s career started in 2004 while in college where he played as a defensive end instead of a wide receiver. From the year 2006 to 2017, Jordy Nelson has suffered about 11 different injuries ranging from the ankles pulls, sprains of the ligaments and shoulder and chest fractures that have seen his play time in the NFL reduced proportionally. In 2006, he missed out on most games due to the posterior cruciate ligament injury he earlier sustained; he, however, racked up 206 pass receptions for 2,822 rushing yards, and 20 touches all in 36 games played to the end his college career. He started playing for the Green Bay Packers after being drafted in the 2008 NFL Draft. He was elected third wide receiver alongside Donnie Avery as 1st and Devin Thomas as second in the draft. He had a great start and finished his rookie season, with a 33 pass reception for 366 yards rushes. Nelson suffered from medial cruciate ligament (MCL) in 2009 and a thigh hamstring sprain in 2012 still, he managed to record 71 receptions for 1065-yard rushes, and 9 touchdowns in his 25 games played in the two seasons (2009 and 2012) respectively. Later in 2015, a torn anterior cruciate ligament sent Nelson off the field of play during the preseason playoffs in the game against the Pittsburgh Steelers. He later in March 2015 also underwent an inguinal hip sprain surgery which meant he missed the rest of the season. He eventually returned to action and with a good balance play between him and Aaron Rogers, he was able to pull off 97 receptions for 1 257-yard rushes and 14 touchdowns which saw him cart away the NFL Comeback Player of the Year in 2016 and was ranked 48th NFL Top 100 players. He was unable to repeat the feat of 2016 in 2017 because Rogers was ruled out injured. He joined the Oakland Raiders on a two-year contract in March 2018. So far, the elite wide receiver has recorded a total of 561 receptions for 8,074 receiving yards and 70 touchdowns in his NFL career. Who is His Wife – Emily Nelson? Nelson is married to Emily Nelson (née Rothlisberger). They grew up in the same town and they both attended the same schools right from kindergarten. She is presently a kindergarten teacher at Fort Howard Elementary School in Green Bay. The couple has hosted the annual Young Life Green Bay Fall Fund Raiser on more than one occasion. They are blessed with three children; Royal, Brooks, and Adda Jo, whom they adopted in 2017. Jordy Nelson has a height of about 6 ft 3 inches and his weight is quite proportional to his height. He weighs about 98 kg. His arm length is 32.5 inches and hand size is 10 Inches.